Do you love to go bowling with your family? Or are you looking for a new place to have a date night? Maybe a spot with a busy bowling alley, an arcade, laser tag options and more? You are in luck, Main Event is now in Louisville. The state-of-the-art entertainment destination is sure to be a go-to spot for food and fun. What is at Main Event? Designed for all ages, the entertainment center is close to 50,000 square feet (that is a lot of space for gaming fun). 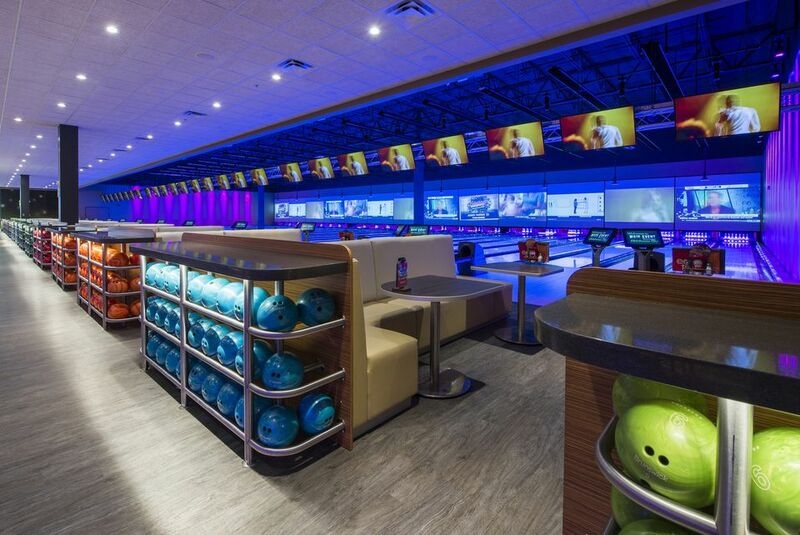 Visitors will find state-of-the-art bowling on 22 ice-white lanes accented with black lighting, a multi-level laser tag arena, a challenging gravity ropes course and more than 100 interactive and virtual games. Plus, for those interested in caching up with the Cardinals, there are televisions throughout for sports viewing. In short, if you are looking for a new option for birthday parties or get togethers, add Main Event to your possibilities. The attraction has private room options, free Wi-Fi and the latest audio/visual technology. The Main Event in Louisville is located at 12500 Sycamore Station Place. The organization runs entertainment complexes in multiple cities. The main website for the Main Event is here, or visit the Louisville Main Event page for local details. Of course there is food! Menu options include an extensive menu featuring burgers, steaks, specialty pizzas and much more, and a full bar serves innovative cocktails, wines and craft and local beers. What Restaurants Offer Free Meals for Kids? Wonder if bowling is for you? Or if your family will enjoy a bowling outing? Bowling, or gaming in general, can be a great way to bond as a family. Below is a list of reasons to start a family bowling tradition. • Nobody is left out. Here is the great thing about bowling...anyone can do it and you don't need your own equipment. Show up and the lanes will have the shoes and the bowling balls all ready for you. While you probably won't score a perfect score your first time out, you can usually knock down a pin or two without too much practice. A small victory, but it will still give everyone in the family something to cheer about. Have little ones that always throw gutter balls? That's what side bumpers are for, ensuring everyone stays on the lane (and scores). • Get some exercise. Ok, it's not running a marathon, but bowling is a lot more exercise than sitting on the couch. Head to the lanes and stretch your body in new ways. Besides, bowling lanes have the benefit of being climate controlled, air conditioned in summer and heated in winter. You can get out and get active without much discomfort. • Affordable. Ok, for this one it all depends on the consumer. It is possible to spend a lot bowling, particularly if you aren't looking for deals and are ordering up beverages and snacks with every frame. But, if you are on a budget, know that many lanes offer passes and two-for-one nights. There are even free summer bowling programs for kids when school is out.